Monday evening was the first meeting of the year for the Tippecanoe Valley School Board, and the first ever for new board members Stan Miller and Todd Hoffman. 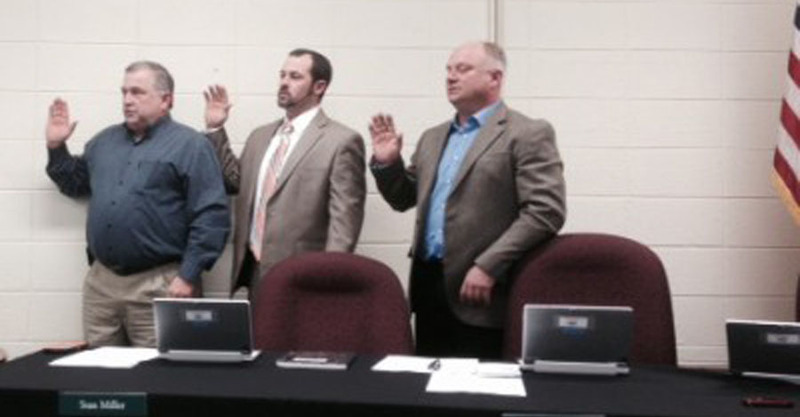 The meeting began with Miller, Hoffman and re-elected board member Bryan Murphy taking the oath of office to begin their new terms. Following the swearing in, the meeting moved to the reorganization of the board. After being nominated by Dave O’Brien, Murphy was unanimously approved to stay on as the board’s president for the next year. Murphy returned the favor by nominating O’Brien to be the 2015 board’s vice-president. The motion was approved unanimously. Tom Craft and Jessica McFarland were unanimously approved as the 2015 board secretary and treasurer, respectively. The board also unanimously approved a motion to move the 2015 meeting times up a half-hour. The meetings will continue to take place place on the second Monday of each month, but at 6 p.m. rather than 6:30 p.m.
Micah Lukens from the Burket Educational Center’s Alternative Education Program gave a presentation, recognizing four of the program’s students for exceptional work ethic, attitude and performance. The students, who were all present, are Maci Jaberg, Austin Carter, Kylah DeCrow and Daniel Bean. The board member’s all commended the students before turning to also praise Lukens for his work as a teacher in the program and his commitment to the students’ success. The board unanimously approved Dr. Francisco Negreros as the corporation physician and approved Sunday afternoon use of the Tippecanoe Valley High School gymnasium for the high school’s Volleyball Club. A presentation was given by Todd Glenn on the TVHS soccer field project. The proposition named Hostetler Lawn and Landscaping Inc. to be in charge of the project after the company submitted a bid of $57,100. The project is expected to take less than a month and will result in the development of one large field for games and one smaller field for practices. TVHS club soccer coach Mark Gordon spoke after the presentation and explained how he hopes to grow the soccer program from just a single boys club team to having both boys and girls varsity teams, as well as junior high and youth league feeder programs. He stated, “I am as excited as I was when I came and talked to you all last year. I’m still excited to get this thing going.” He explained that the team is starring to get more games scheduled and that they had even had the chance to scrimmage against the Haiti Women’s National Soccer team due to the fact that a friend of his was the coach. Following the regular meeting there was a very brief executive session for the board of finances. In the second meeting, that lasted about four minutes, the board was shown a slide that conveyed that the corporation still has $1,075.09 in outstanding checks.